Place the Velcro circles on each end of the craft sticks, just make sure you put one rough and one smooth one on each end. On the other side of the sticks, color code the ends for the shape you would build with it. Also, label the shape in the center of the sticks with a marker. The woman who made this swap activity started to put velcro on but then thought it might make it harder for the little ones, so she just included it in the bags if we wanted to use it. There are color coded adult models and sticks for the following: square, rectangle, diamond and triangle. You can lay out the model and let the kiddos copy the shapes with their own sticks. Also included are some extra blank sticks if there are any other shapes you or your kiddos come up with. 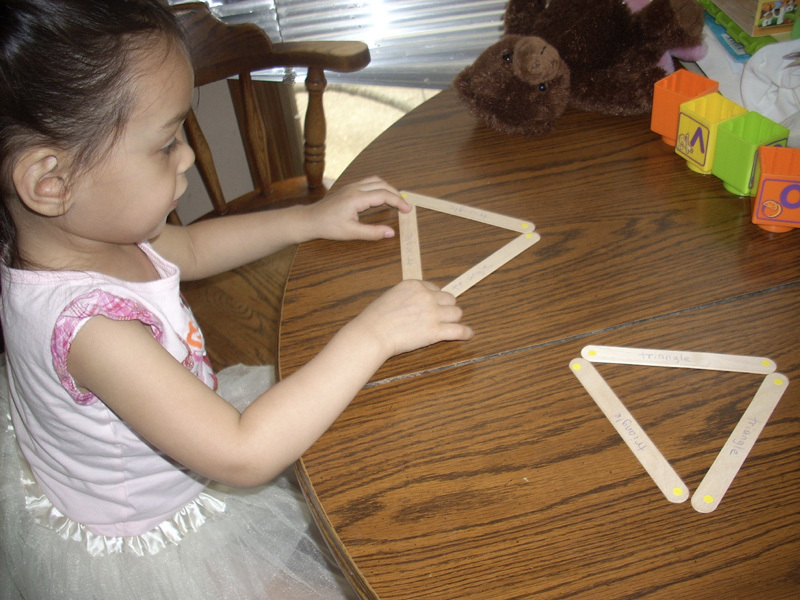 Leah, 2.5 years old, copying the triangle laid out for her to mimic. She also likes to create her own shapes from the sticks.